John Dyer-Bennet was born on April 17, 1915, in Leicester, England. When John was five years old, his family moved to Canada and from there to Berkeley, California, a few years later. He earned his bachelor's and master's degrees from the University of California, Berkeley, and a second master's degree and Ph.D. from Harvard University. He went into the U.S. Army in 1941 as an enlisted man, was commissioned and rose to the rank of lieutenant at the end of World War II. He was reactivated during the Korean War and rose to the rank of major. He continued in the reserves and retired with the rank of lieutenant colonel. He began his teaching career as a teaching assistant at the University of California and was an instructor in mathematics at Vanderbilt University. From 1946 to 1960, he held the titles of instructor, assistant professor, and associate professor of mathematics at Purdue University. He came to Carleton in 1960 as an associate professor of mathematics. John retired in 1980, but continued to teach at Carleton until 1993. He specialized in linear and abstract algebra, and was a member of the Mathematical Association of America, the American Mathematical Society, Phi Beta Kappa, Sigma Xi, and Pi Mu Epsilon. "John was one of the most respected faculty members of his time," said Sy Schuster, the Laird Professor Emeritus of Mathematics and the Liberal Arts. "He was the embodiment of fairness, and that's why he was called upon by the administration and faculty to act as an ombudsman so many times in his career." In a 1990 interview, Dyer-Bennet said, "I knew since high school that I wanted to teach mathematics at the college level. I've always enjoyed it. I enjoy dealing with young people. When I teach, I feel I am part of an operation that seems to matter. I'm not living for myself, but I'm part of a group that matters." 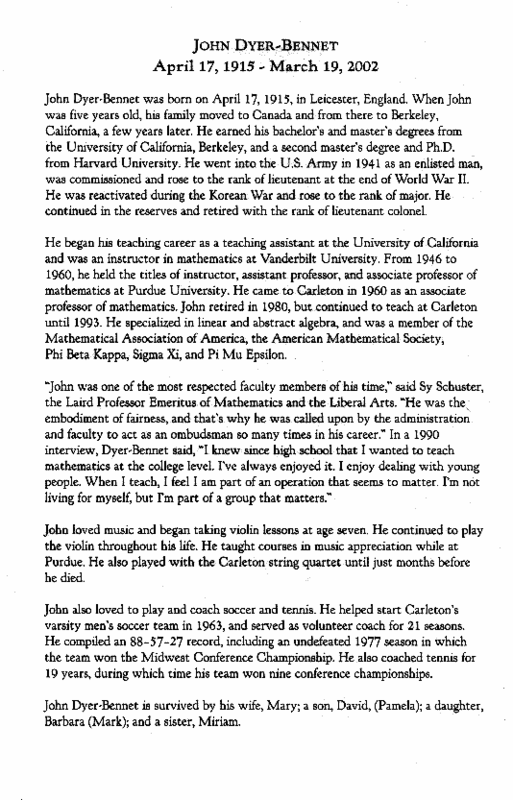 John loved music and began taking violin lessons at age seven. He continued to play the violin throughout his life. He taught courses in music appreciation while at Purdue. He also played with the Carleton string quartet until just months before he died. John also loved to play and coach soccer and tennis. He helped start Carleton's varsity men's soccer team in 1963, and served as volunteer coach for 21 seasons. He compiled an 88-57-27 record, including an undefeated 1977 season in which the team won the Midwest Conference Championship. He also coached tennis for 19 years, during which time his team won nine conference championships. John Dyer-Bennet is survived by his wife, Mary; a son, David, (Pamela); a daughter, Barbara (Mark); and a sister, Miriam.